File system of setup volume not supported. This software cannot be installed because the file system of the OS volume is not supported. Unsupported file system on system disk. Install the product onto an HFS+ or HFSJ non-case-sensitive drive. 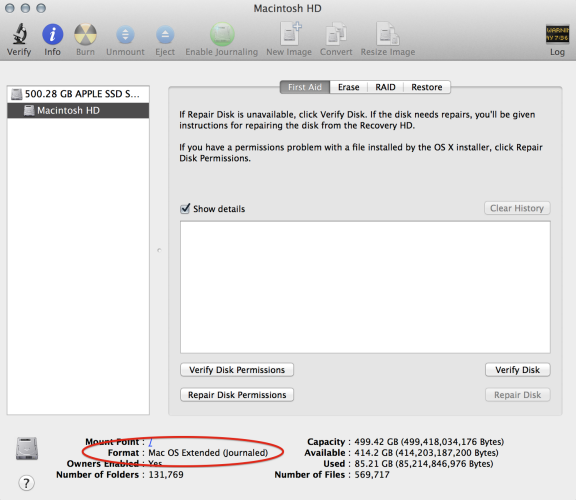 To determine whether your drive uses a supported file system (like Mac OS Extended [Journaled]), open the Disk Utility application in your Applications/Utilities folder. The graphic below shows where you can find the drive format information. Click your drive and note of the Format type. You cannot install Adobe products on a volume that uses a case-sensitive file system, such as HSFX (HFS+) or UFS. This limitation applies to both the startup drive as well as the drive onto which the software is installed.